Updated reports on the group’s work in Zambia in 2011 and 2012 are now available. The Norwegian Geotechnical Institute (NGI) and the Norwegian University of Life Sciences (UMB) have a truly global research agenda with biochars for use in soils as well as laboratory research on biochar characterization. In the last two years, the team has set up biochar projects in Zambia, Indonesia, Malaysia and Nepal working with farmers to carry out in-depth field trials on the effect of biochars in local soils—especially in poor acidic sandy soils. They are also working with local groups to produce biochars on site with available feedstocks using various production systems. In addition, laboratory work has been and is continuing to be carried out in Norway on nutrient availability, the stability of biochar, and the presence of polyaromatic hydrocarbons (PAHs) and dioxins in biochar. The team projects are led by Prof. Gerard Cornelissen, Prof. Jan Mulder, Dr. Sarah Hale, Prof. Gijs Breedveld, and Dr Magnus Sparrevik and the postdocs are Dr. Vanja Alling and Dr. Vegard Martinsen. Five PhD students will start in the near future in Norway, Indonesia, Zambia, Nepal and Malaysia to specifically carry on this research. For all the field trial work, there is a set step-by-step project format to ensure that these field trials are set up following project guidelines. Step 1: The team chemically screens soil-biochar combinations from many sites in a country to determine the nature of the soils and the type of biochars that would ideally be most effective based on feedstock availability. Step 2: Pot trials are set up to test the performance of biochars on crops specifically to determine the potential of biochar to: reverse acidification, increase nutrient availability and plant-available water, increase crop growth, and decrease plant uptake of harmful pollutants. Step 3: Based on results from the pot trials (if positive), field trials are set up with controls to measure the difference between biochar and fertilizer amended soils with various crops. Step 4: Laboratory tests are set up to look at nutrient availability and leaching based on pot and field trials. Step 5: Consideration of the best technologies for successful biochar generation: depending upon the local situation, the project group tests out biochar stoves and larger kilns to determine what types of production units will fit the geographic region. Step 6: The team uses the data to date to perform life cycle assessments (LCAs) on different biochar production systems. Step 7: As a final step, the group conducts economic cost-benefit analyses and business concepts around energy derived from biochar generation to see if the biochar system makes a positive economic impact in the community. Since October 2010, researchers at NGI and UMB have, together with the Zambian Conservation Farming Unit (CFU) and the University of Zambia (UNZA), mixed in biochar at six different sites in Zambia, and have had positive results: the maize harvest increased by up to a factor of four at low application rates of only 4 tons biochar per ha (t/ha). The suspected reason that the low application rate was so successful was due to the combination of very poor sandy soils with conservation farming, where planting is done in basins that only cover 10% of the surface. By mixing the biochar in the basins instead of broadcasting it on a larger area, the biochar is placed exactly where the plant roots are, and thus much lower amounts of biochar (and fertilizer) are needed. The team hypothesizes that the main mechanistic reason for the effectiveness of the biochar in these sandy soils is a doubling of plant-available water (from roughly 10% to 20%). Additional reasons are a doubling of the cation exchange capacity (from 4 to 8 cmol/kg) and an increase in pH (from around 4 to 6). The ultimate goal is to use these results to find out in which regions farmers can benefit most from the biochar, and to implement the concept via the framework of CFU, where already 200,000 farmers (20% of the total Zambian farmer population) have converted from conventional to conservation agriculture. 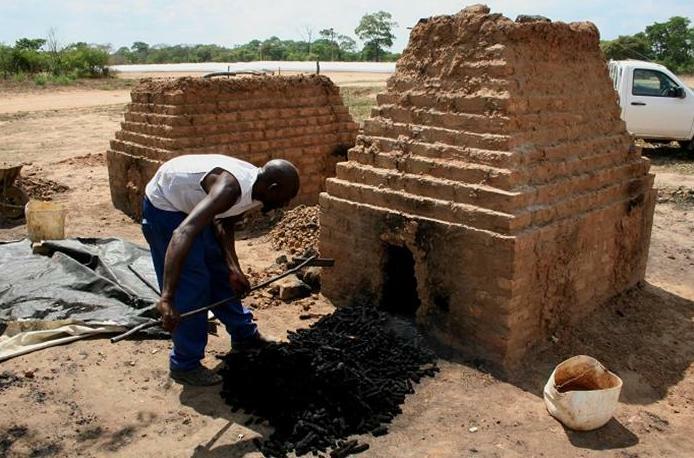 The biochar used in the Zambia field trials is from biochar cookstoves as well as several larger-scale brick kilns. 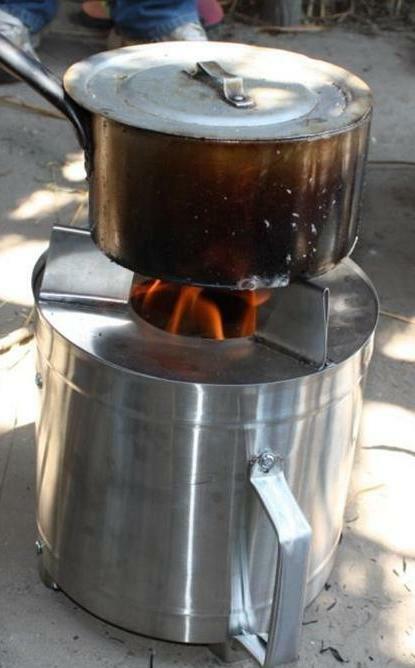 Stoves have been supplied to participating farmers so they can work with them; the team supplies in-person technical support for the stoves (they are using the Peko Pe model) by the son of its inventor Pål Wendelbo. The Zambia initiative is financed by the Norwegian Embassy and the Zambian Conservation Farming Unit, while the Indonesia, Malaysia and Nepal projects are financed by the Norwegian Research Council. Field trial work in Indonesia began in January 2012 with several sites set up in collaboration with the Indonesian Soil Research Institute and UN Development Program. They are based in Sumatra (acid ultisol; corn, dry and wet rice), Kalimantan (acid sulphate soil; wet rice), West-Timor (alfisol; corn), and Sulawesi (sandy, acid soil; corn and cacao). 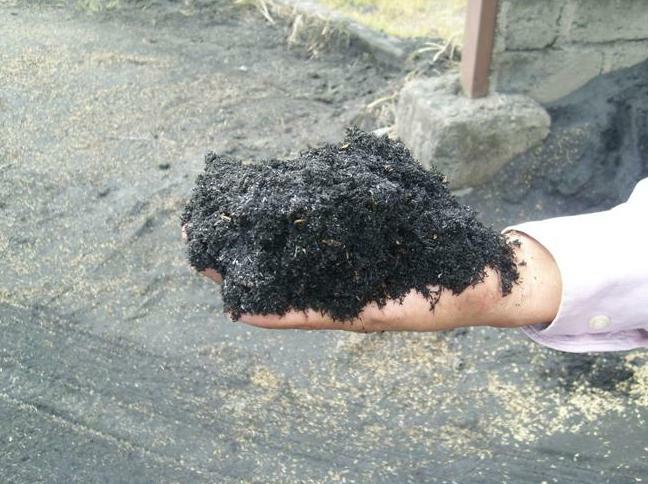 In June 2012, the team will establish field trials in Malaysia on degraded sandy soils using biochar produced from rice husk. Rice husk is one of the main waste biomass materials in the area and it will be produced at local rice mills (where the pyrolysis heat is used for drying the raw rice) and then compared to a material produced in a more controlled system based on the Belonio stove (a different stove model). The Malaysian partners include the University of Kuala Lumpur and the Malaysian Agricultural Institute (MARDI). The university of Kuala Lumpur has experience with producing biochar and possesses small scale equipment including a biochar experimental kit (BEK) which can produce a “designer biochar”. In Nepal the focus will be on coarse, acidic, alluvial soils, with the Nepal Agroforestry Foundation and the Environment and Public Health Organization as partners. The work plan is being developed at this time, and greenhouse and field work will commence in the course of 2012. In addition to the work on field trials and small scale production in the above-mentioned countries, the team at NGI is also focusing on characteristics of biochar by carrying out research in the lab. Theoretically, the pyrolysis and gasification processes used to make biochar can produce small amounts of the toxicants known as polyaromatic hydrocarbons (PAHs), polychlorinated dibenzo dioxins (PCDDs) and polychlorinated dibenzo furans (PCDFs). These organic compounds are known to become tightly bound to the stable carbon portion of biochar and for this reason, biochar is being used to remediate soils that are contaminated with PAH and other organic contaminants. The NGI research has looked at both the potential of pyrolysis and gasification to produce unwanted toxic compounds, and also the ability of biochars to sorb toxic compounds and make them biologically unavailable. One study is exposing biochar to harsh aging regimes and then testing the ability of biochar to sorb a PAH (pyrene). Research suggests that biochar has a high ability to sorb pyrene, making it a viable choice for remediation work. This research shows that even after harsh aging (using high temperature, biological media, and freeze thaw cycles) there was no significant change in the ability of the biochar to sequester pyrene. In other words, biochar’s ability to continue to sorb pyrene is not affected by harsh aging conditions. This finding is very encouraging in the context of remediation—the research suggests that if biochar was added to a contaminated soil or sediment in order to bind pollutants, it would be suitable as a remediation device for a long period of time under varied environmental conditions. A second study was carried out to look at the total and bioavailable concentrations of PAHs and dioxins in sixty biochars produced between 250 and 900 °C in slow pyrolysis, fast pyrolysis, and gasification systems in various countries. This issue is very important not only in the context of guidelines determining testing limits for biochar, but also in examining the effects of production temperature and time as well as feedstocks. The total concentrations of PAHs were found to be low for the slow pyrolysis biochars and were dependent on biomass source, pyrolysis temperature, and pyrolysis time. With increasing pyrolysis time and temperature, PAH concentrations generally decreased. Both total and bioavailable PAH concentrations in the fast pyrolysis and gasification biochar were slightly higher, with maximum levels below most soil quality standards. Total dioxin concentrations were low and bioavailable concentrations were below the analytical limit of detection. This research suggests that producing biochars from woody feedstocks, using higher production temperatures (between 500°C and 600°C) and longer pyrolysis times resulted in lower toxin concentrations. This is encouraging in those cases where a slow pyrolysis method of making biochar can be incorporated into traditional farming practices in order to produce biochar for a soil amendment. The team is continuing research on determining how biochar can best supply much needed nutrients to soils and in other cases bind contaminants, depending on the stated purpose. In addition the team is hoping to perform a more complete evaluation of biochar suitability for soils and agricultural systems in Africa compared to Asia . Hale, S. E.; Lehmann, J.; Rutherford, D.; Zimmerman, A. R.; Bachmann, R. T.; Shitumbanuma, V.; O’Toole, A.; Sundqvist, K. L.; Arp, H. P. H.; Cornelissen, G., Quantifying the Total and Bioavailable Polycyclic Aromatic Hydrocarbons and Dioxins in Biochars. Environ. Sci. Technol. 2012. Hale, S. E.; Hanley, K.; Lehmann, J.; Zimmerman, A. R.; Cornelissen, G., Effects of Chemical, Biological, and Physical Aging As Well As Soil Addition on the Sorption of Pyrene to Activated Carbon and Biochar. Environ. Sci. Technol. 2012, 46 (4), 2479-2480. 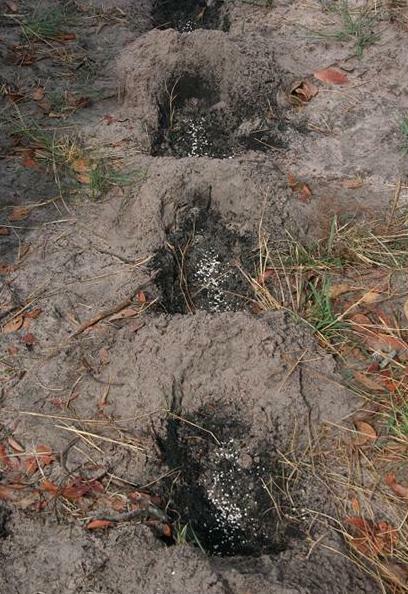 Biochar and fertilizer in the planting basins, Mongu, Zambia: photo courtesy of: Gerard Cornelissen. 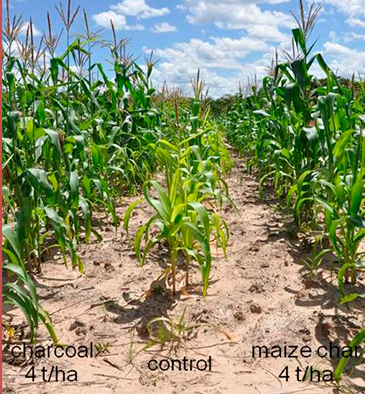 Conservation Agriculture Maize plots after 2 months (only 4 tons/ha biochar) measured against the control in Kaoma, West Zambia: photo courtesy of: Gijs Breedveld.